On “reverse racism,” half of white Americans overall agree “discrimination against whites is as big a problem today as discrimination against blacks and other minorities.” But the socioeconomic divide on this opinion is fairly vast. Among working-class whites, a solid majority, 60 percent, believe the tables have turned and anti-white discrimination equals that faced by other historically marginalized racial and ethnic groups. But just 36 percent of college-educated white Americans cosigned this idea. Blacks and Hispanics overwhelmingly reject the notion, by 75 and 71 percent, respectively. Delusional thinking by low income people who have enjoyed white privilege all their lives is understandable. Their position on the receiving end of class discrimination has profound economic effects over generations, obscuring the advantages their skin color has conferred. 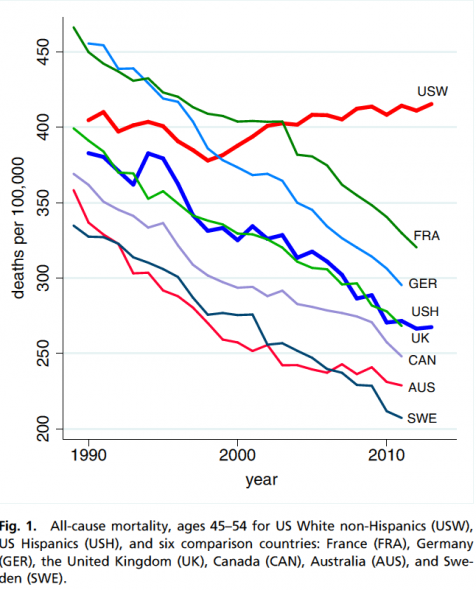 Also profound health effects, as the group of whites in the U.S. with a high school education or less now has a high death rate before age 55, mostly from addiction or suicide. But, they lack the information to tell the difference between the effects of class vs. race. Being a passive consumer of corporate "news" is a recipe for ignorance, and that goes for watching MSNBC and NPR as well as Fox. For accurate information, they'd be better off reading the satirical website The Onion. What they do have is plenty of misinformation blaming their plight, not on other whites who run wealthy corporations, but on immigrants, Muslims, people of color, and people with political leanings indicating they do understand the situation. An analogous situation is the fact that in the U.S. obesity correlates with education level attained. While the cause and effect of studies that showed this remain unexplored, I'm willing to be that it comes down to decision making about what to eat. If corporate advertising is the determinant, then obesity will be the result. Also if you are low income (which also correlates closely to education level) your low cost food options will be factory-processed carbohydrates sold by corporations, rather than fresh fruits, vegetables and protein from your local farmers. Exploiting the suffering and confusion of low income people is nothing new. Getting them to identify an "other" as a scapegoat is nothing new, either. And the terrifying results are all too familiar. Native people whose land was stolen and who have survived attempted genocide in North America do not consider themselves people of color. They are indigenous inhabitants of what was once a bountiful life support system -- if you knew how to respect the ecological balance of life forms coexisting in it. As a group native people have been economically marginalized by whites for hundreds of years, and they have the low incomes and poor health outcomes to show for it. 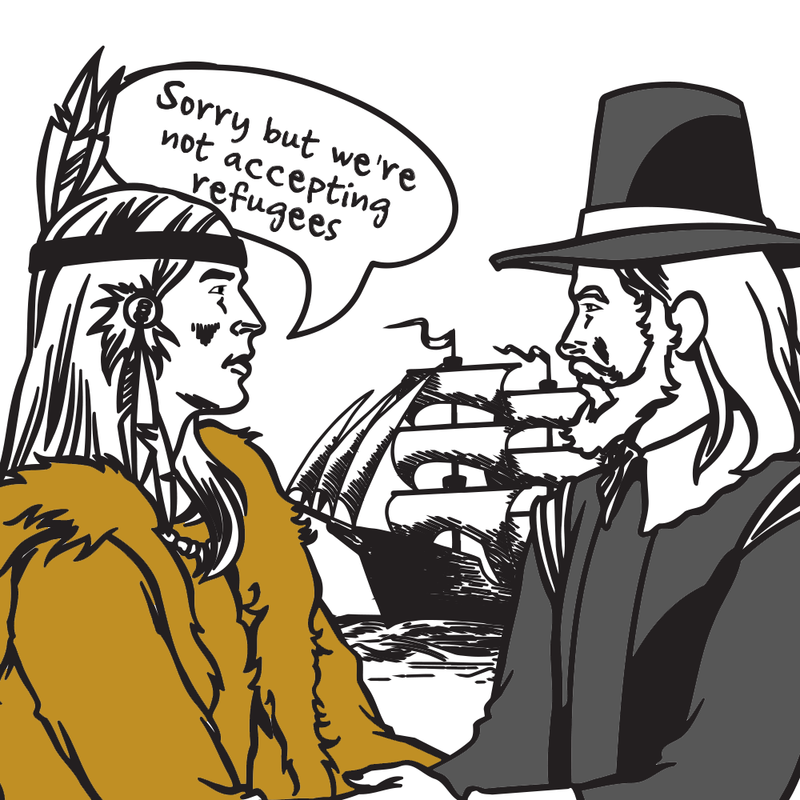 Native people are offended by Thanksgiving myths that gloss over the theft and the genocide. They ask us not to teach our children these myths, but to have the courage as white, privileged folks to acknowledge that we were born on third base -- we didn't hit a triple. And they're right. It isn't fair. Corporations pay little or no taxes in these days of corporate government -- so a self-employed cabinet maker is taxed at a 30% rate to make up the difference. So angry white people cling to their traditions and insist that Thanksgiving is a jolly family holiday with no dark side. They cling to believing that if they're struggling economically, it must be because Obama went to Harvard on scholarship. Increasingly, the more deranged among them commit hate crimes. The corporate media chalks these crimes up to mental illness. If the murderers were Black or Muslim the corporate media would call them terrorists. I enjoy a family dinner as much as the next person. But let's not pretend everyone has equal access to the harvest feast table. I just did a Maine Social Justice 2 part show on Maine Cable Access TV. It covered White Privilege and Power and also about the State of Maine taking of the Penobscot River from the Wabanaki. This country was founded on racism. Even the second amendment of our constitution was put in to allow slave states to arms themselves to hunt down and shoot runaway slaves. Otherwise the slave-holding states never would have ratified the Constitution.